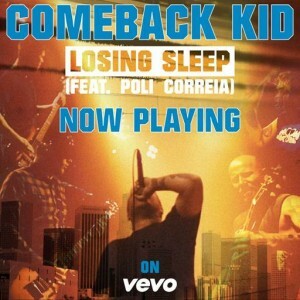 From deep inside the pit, COMEBACK KID come out swinging with ‘Losing Sleep’, the latest video from Die Knowing. Filmed live in concert all over the world, the full-contact video features studio footage with guest vocalist Poli Correia of Devil In Me, and erupts in your face showing what goes down at a COMEBACK KID show. “This video is a compilation of the last two years of our life and ‘Losing Sleep’ is one of the hardest hitting songs we’ve ever wrote”, tells lead vocalist Andrew Neufeld. On April 18th, COMEBACK KID will be releasing Rain City Sessions +1, a 10 inch colored vinyl release exclusively for Record Store Day which includes a blistering, studio recorded version of Nirvana’s ‘Territorial Pissings’, and six previously unreleased live tracks. Pick up the latest masterpiece, Die Knowing, at Victory Merch. COMEBACK KID return to Mexico this week to deliver their stomping anthems for four rare shows, before jetting to Europe in April as part of the Impericon Festival with Bane.